I am a big supporter of the Traditional Chinese Medicine (TCM). An important part of the TCM is the concept of the energy meridians and acupoints. 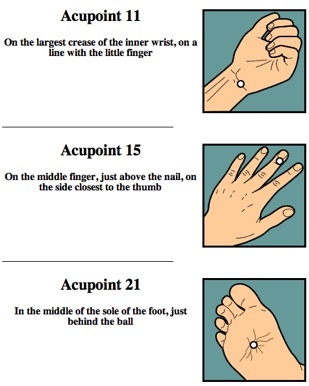 These acupoints are active points that have effect on the body or the mind, when stimulated. The usual form of stimulation in the Traditional Chinese Medicine is inserting very thin needles into the points and leaving them there for about 20 minutes. This is called acupuncture and it can be very helpful in many conditions where modern medicine still struggles. You should stimulate those points by pressing on them for a about a minute on each side of the body. More conditions can be selected from the site and another set of points will be shown. This stopped me from screaming because of a REALLY annoying clicking radiator in a class. Thanks. very nice : D they worked like a charm for me. I feel so good now.